To follow this tutorial you will need a Mac with Xcode installed, and knowledge of Xcode and Swift. You'll also need basic knowledge of PHP (including the Laravel framework), a Pusher account, and Cocoapods installed on your machine. Push notifications are a great way to engage users of your application. It lets you send notifications when certain events happen on your service. This can lead to re-engagement. While building a social network app, you'll need to send push notifications to your users. These notifications will help users know when certain events happen in your application. For instance, you can send push notifications to a user when someone comments on their photo. As powerful as push notifications are, they are a double-edged sword. Most users will uninstall your application if they feel like they are being spammed. Over the course of two articles, we will see how we can build a social networking iOS application. We will add push notifications to the user when someone comments on a photo they uploaded. Then we'll add settings so users can specify when they want to receive notifications. A Mac with Xcode installed. Knowledge of the Swift programming language. SQLite installed on your machine. See installation guide. A Pusher beams API Key. Create one here. Cocoapods installed on your machine. See installation guide. ⚠️ To use push notifications, you have to be a part of the Apple Developer program. Also, push notifications do not work on simulators so you will need an actual iOS device to test. Pusher Beams has first-class support for native iOS applications. Your iOS app instances subscribe to Interests; then your servers send push notifications to those interests. Every app instance subscribed to that interest will receive the notification, even if the app is not open on the device at the time. This section describes how you can set up an iOS app to receive transactional push notifications about news updates through Pusher. Pusher relies on the Apple Push Notification service (APNs) to deliver push notifications to iOS application users on your behalf. When we deliver push notifications, we use your key that has APNs service enabled. This page guides you through the process of getting the key and how to provide it to Pusher. The next thing you need to do is create a new Pusher Beams application from the Pusher dashboard. When you have created the application, you should be presented with a quick start that will help you set up the application. 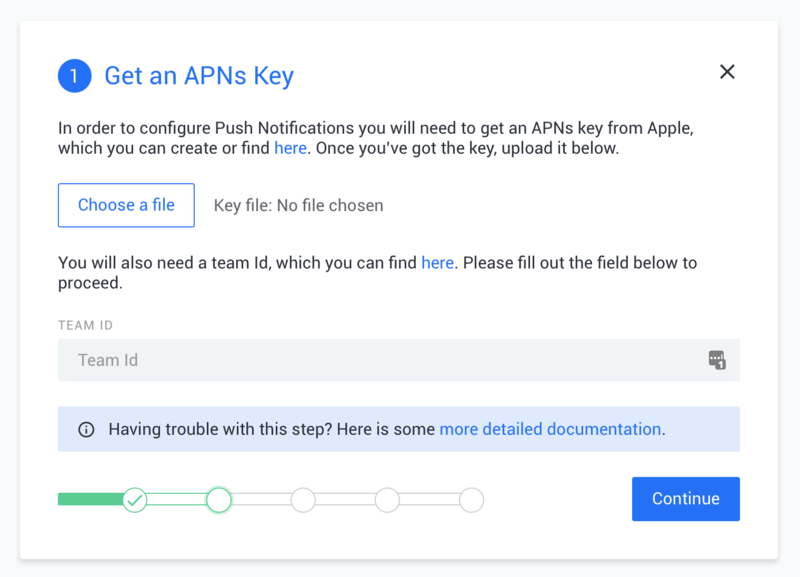 In order to configure your Beams instance, you will need to get the key with APNs service enabled by Apple. This is the same key as the one we downloaded in the previous section. Once you’ve got the key, upload it. Enter your Apple Team ID. You can get the Team ID from here. You can then continue with the setup wizard and copy the instance ID and secret key for your Pusher application. This will create a new Laravel application in the gram directory. Our application will need to connect to a database and we will be using SQLite as our database of choice as it's the easiest to set up. Now we have a connection to the database. After running the commands, we should have migrations in the database/migrations directory, models in the app directory, and controllers in the app/Http/Controllers directory. In the model above we have the user and comments methods, which are relationships to the User model and the PhotoComment model. In the model above we are using the Notifiable trait because we want to be able to send push notifications when new comments are made on photos later in the article. We also have a scopeForPhoto method, which is an Eloquent query scope. We also have a user method, which is a relationship to the User model. allowsCommentsNotifications checks to see if the owner of the photo has settings that permit notifications to be sent to them when there is a new comment. isFollowing checks if a user is following another user. scopeOtherUsers is an Eloquent query scope. following, followers and settings are methods that define relationships with other models. Above we have the scopeForCurrentUser method, which is an Eloquent query scope. We set the $timestamps property to false to instruct Eloquent not to attempt to automatically manage the created_at and updated_at fields as we do not have them in the user settings table. As seen above, when a new user is created, a new user setting is saved to the user. In the PhotoController above we have two methods. The index displays all the available photos, and the store saves a new photo to disk and database. The command above will create a symlink from the public/storage directory to the storage/app/public directory that our photos will be uploaded to. In the PhotoCommentController we have two methods. The index method displays all the comments for a single photo and the store creates a new comment. In the store method on line 30, we have a call to a notify method and passes a nonexistent UserCommented class. This class is a Laravel notification class. We will create this class later in the article. It’s needed to send notifications to the user when comments are made. The UserController has two methods, one is the index method that returns all the users on the service, and the second is the create method that registers a new user and returns an access token that will be used for making authorized requests on behalf of the user. The controller above simply follows or unfollows a user. In the controller above we return all the settings available for a user in the index method and then we update the settings for the user in the update method. Above we have defined routes for our application. Each route points to a controller and a method in that controller that will handle the route. The route group above has a middleware applied, auth:api, this will make sure that every request to a route inside the group has to be authorized. To manage authorization, let’s install Laravel passport. Passport is successfully installed after the commands finish execution. The passport:install command will create two files in the storage directory: oauth-public.key and oauth-private.key. These keys will be used to sign and validate access tokens. ⚠️ Copy and save the client ID and secret for the second client as you will need it later in the article. The next thing we want to do is add push notification support. For this, we will be using Pusher Beams. For convenience, we will be using a PHP library that is a Laravel supported wrapper for the Pusher Beams PHP library. 💡 You need to replace the PUSHER_BEAMS_SECRET_KEY and PUSHER_BEAMS_INSTANCE_ID keys with the keys gotten from your Pusher dashboard. In the class above we are extending a Notification class and we have implemented the toPushNotification method, which will be used to send the push notification when required. In the via method, we specify what channels we want to send the notification through and in the pushNotificationInterest we specify the interest we want to publish the push notification to. If you remember earlier, we invoked the notification on line 30 of the PhotoCommentController. 💡 Read more about Laravel Notifications and how it works. This will start a PHP server running on port 8000. 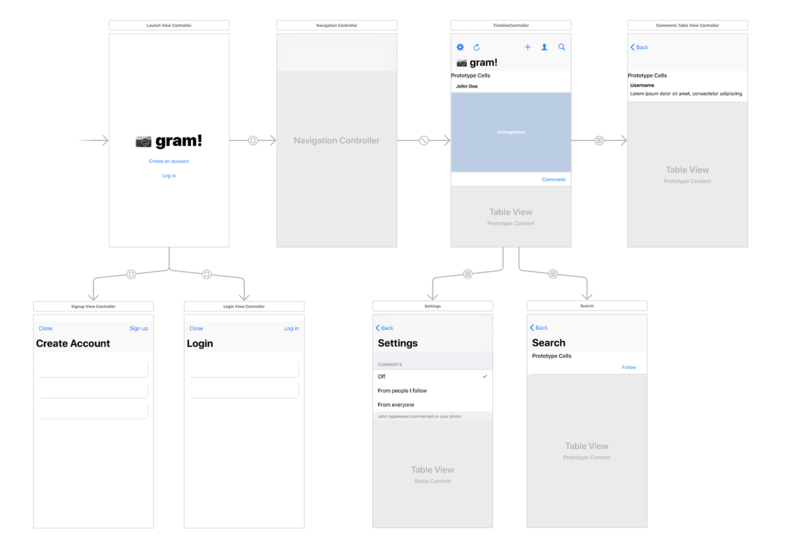 Now that we have a backend server that can serve us all the information we want and also send push notifications, let us create our iOS application, which will be the client application. When the installation is complete, we will have a new .xcworkspace file in the root of the project. Double-click the workspace file to relaunch Xcode. The first scene we have a launch view controller. This controller connects to the login scene, register scene or the main navigation controller depending on the login status of the user. The login and register scenes are basic and they simply authenticate the user. The main navigation controller connects to the main controller that displays the timeline. From that scene, there are connections to the settings scene, the search scene, and the view comments scene. Each segue connection is given an identifier so we can present them from the controller code. When you are done creating the storyboard, let’s create the custom classes for each storyboard scene. To help us with managing our API’s JSON responses we will be using Codable in Swift 4. This will make it extremely easy for us to manage the responses from the API. Our services will contain code that we will need to make calls to the API and also other functionality that interacts with the application view. static let key = "gram.settings.notifications"
In the class above we have defined the settings service. The class is how we manage settings for our application. In the allSettings setter, we attempt to fetch the settings from the local store and if we cant, we return some sensible defaults. We have the loadFromDefaults method that loads the settings locally from the UserDefaults, the loadFromApi class that loads settings from the API using the ApiService, the updateCommentsNotificationSetting, which updates the comment notification settings. Finally, we have the saveSettings method that saves the comment locally and remotely. The enum is basically a representation of the available settings for our comment notifications. static let key = "gram-token"
The class above is fairly straightforward and it provides methods for authentication. It has the getToken and saveToken, which essentially retrieves and saves the access token gotten after authenticating the user. Now that we have the base of the class, let’s start adding methods to the class. Since it is a large class, we will split adding the methods over a few paragraphs. In the methods above, you’ll notice we decode the JSON response from the API into the appropriate model object. This makes it easier to work with in our controllers. let status = following ? "unfollow" : "follow"
Next let’s add the class’ helper methods. The url method takes a URL path and appends the base API URL to it. The requestHeaders method attaches the appropriate headers to the request sent by Alamofire. The request method is a wrapper around Alamofire that sends requests to the API for us. The responseToJsonStringData converts the data from our JSON file into a JSON string which can then be decoded into one of our Codable models. That’s all for the ApiService and indeed all the applications services. In the next part we will continue building our iOS application. 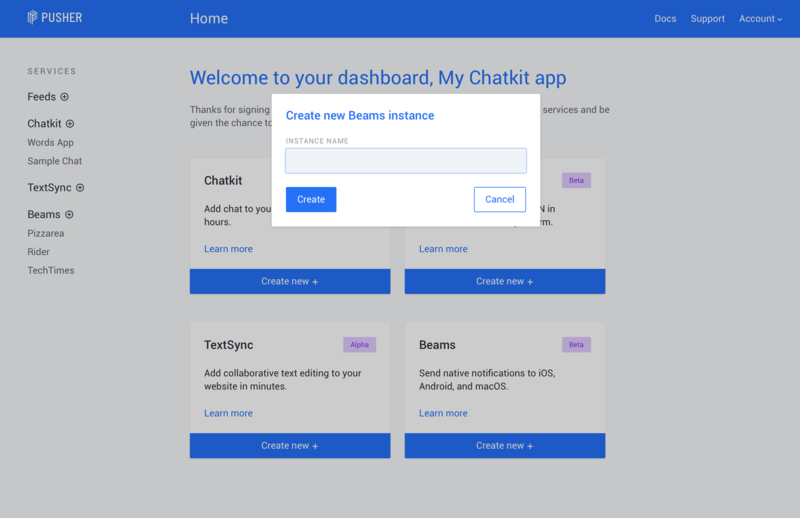 In this first part of the article, we have seen how we can create an API for our social network application using Laravel. We also integrated push notifications on the server side using Pusher Beams. In the next part, we will build the client IOS application using Swift. We will also integrate push notifications to our social network application using Pusher Beams. The source code to the application is on GitHub.